In the comedy Noise (2007) Robbins plays David Owen, a man taking vigilante action against the high level of noise in Manhattan, whilst in another comedy, The Lucky Ones (2008), he plays one of three soldiers returning from the Iraq war only to find that their lives have moved on. 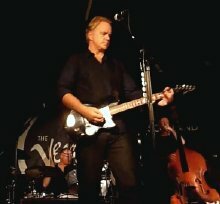 I was thrilled to meet Tim Robbins on 3rd October 2010 when he performed at the Nottingham Glee Club as part of his European tour with The Rogues Gallery Band. He signed a photograph for me in the afternoon, I went to his brilliant show in the evening, and managed to get this photograph with him just before he left. minute short film against the war in Vietnam (he used a still from this film on the cover of his 2010 cd). Angeles to stay with his brother David. 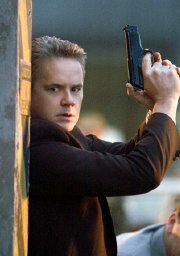 After spending a year delivering pizzas and working as a waiter, Tim Robbins enrolled at the UCLA Film School. He graduated from there in 1981 and, along with actor friends from the University, founded a highly experimental theatre group called The Actors' Gang, which challenged audiences with its anarchic productions! Robbins is still associated with this as its artistic director some thirty years later. With money short, Robbins took on some TV work, along with several small film roles - Larry Tucker in Fraternity Vacation (1985) and Sam Wells in Top Gun (1986). (Golden Raspberry Awards) with Robbins nominated for 'Worst Supporting Actor'! Bull Durham (1988), which Tim Robbins still considers to be his favourite film. This was his breakthrough role, with the film also starring Susan Sarandon (his partner for 21 years) & Kevin Costner. 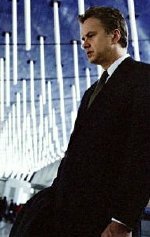 Tim Robbins' next starring role showed that he had a real gift for physical comedy, as the 'dim' executive Norville Barnes in the Coen brothers' The Hudsucker Proxy (1994), co-starring Paul Newman. 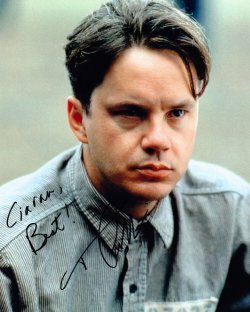 Tim Robbins was now a big box office draw, but his very outspoken criticism of the Gulf War also made things difficult for him. Despite this, his role in The Shawshank Redemption (1994) made him a universally popular star amongst the film going public. murder. Inside, he strikes up a friendship with another inmate, the top procurer 'Red' Redding (Morgan Freeman) and gradually finds favour with the authorities by working tax dodges for them. 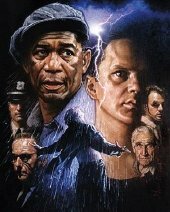 video release, The Shawshank Redemption became a mega hit - many believing it to be the best film ever made! It gained seven Oscar and two Golden Globe nominations in 1995. In the same year as he made The Shawshank Redemption, Robbins appeared in a completely contrasting role. Ed Walters is a car mechanic with a natural knack for special puzzles, and he falls for Albert Einstein's neice in the romantic comedy I.Q. (1994) co-starring Meg Ryan and Walter Matthau. won an Oscar, with Robbins also being nominated for Best Director. Four years later, Sarandon appeared in another film that Robbins wrote and directed - the Depression-era musical Cradle Will Rock (1999). 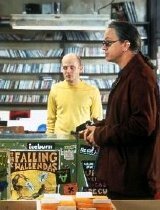 Woody Blake in the sci-fi drama Mission to Mars (2000) and Ian 'Ray' Raymond in the comedy High Fidelity (2000). of films has included the superbly acted Mystic River (2003) directed by Clint Eastwood. 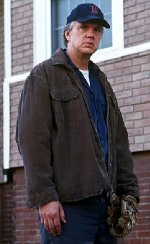 In it, Robbins plays Dave Boyle, a handyman accused of murdering a mugger. It won both an Oscar and a Golden Globe for Robbins, for 'Best Supporting Actor'. Robbins then went on to star with Samantha Morton in the romantic thriller Code 46 (2003) followed, two years later, by Steven Spielberg's blockbuster War of the Worlds (2005). The thriller Catch a Fire (2006) is a real-life story set in apartheid-era South Africa, with Robbins cast as police Colonel Nic Vos. released in September 2010. 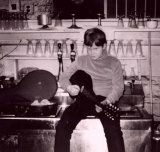 The album cover image is taken from a short anti-Vietnam war film in which Robbins (aged 10) had a part. He is in the centre wearing a hat and glasses. Away from acting, Tim Robbins is an ice hockey fanatic, especially where New York Rangers ('The Blueshirts') are concerned, and claims to own every highlight video released of their 1994 Championship season. married, although his long term relationship with actress Susan Sarandon lasted from 1988 until 2009. They have two sons - Jack (b.1989) and Miles (b.1992). Eva is Tim Robbins' step daughter. Tim Robbins' brother David is a film composer and his sister Adele is an actress. Both worked with Tim Robbins in his films Bob Roberts and Dead Men Walking, with David also providing scores for many of Tim's theatre productions. 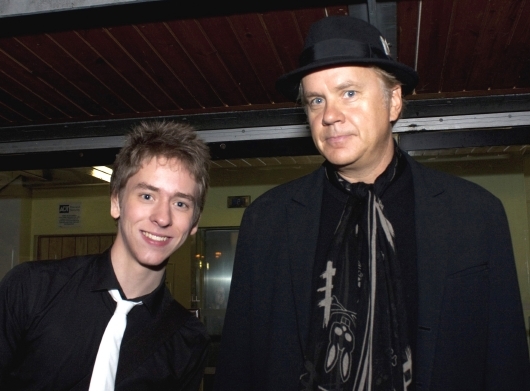 Tim Robbins is 6' 5" in height, and is the tallest man to win an Oscar! On October 10th 2008 Tim Robbins was honoured with his own star on the Hollywood Walk of Fame.